"When it happened, the first thing I would notice were their eyes. It was never a flash of realization, but rather a wave. I might stutter, start to sweat, lose my train of thought, and would start to realize this was more than just a brain hiccup. I'd notice that they were all looking at me....And of course, they were looking at me. They were my students." When I first wrote these words in 2013, I was opening up in a huge way. I hadn't admitted my anxiety attacks to most people, but to admit them as an educator felt especially dangerous. What would happen when my boss or the parents of my students read this? Would I lose my job? I'm supposed to be the strong one—what does it mean to admit vulnerability to our community? Of course, this fear in and of itself only made my anxiety worse. Really, there lies the crux of many problems with the social-emotional health of teachers. We're used to being jacks-of-all-trades, unfazed and unmoved when a problem arises. Kids fighting over resources? Create rotating stations! Need to up parent involvement? Start a kid-created newsletter! We're master problem-solvers who are working in a profession that breeds resourcefulness in spades. Still, we rarely like to admit our own failure. We especially struggle to admit that failure over something as amalgamous and, unfortunately, stigmatized as mental health. When I look back at my own teaching career and consider social-emotional competencies, I realize just how much self-awareness I lacked as a teacher (especially in those first few years). I was hyper-aware of my students and their families and our school community and what I needed to get my credential and everything except taking the time to ask myself, "Hey, are you doing OK?" I try, as often as I can, to approach everything I do as a teacher with a lens of love. In practice, this sometimes means loving myself so that I can love my students in a much bigger, more powerful way. When I am cared for, nourished, and happy, my students are getting an educator who can take better care of them. 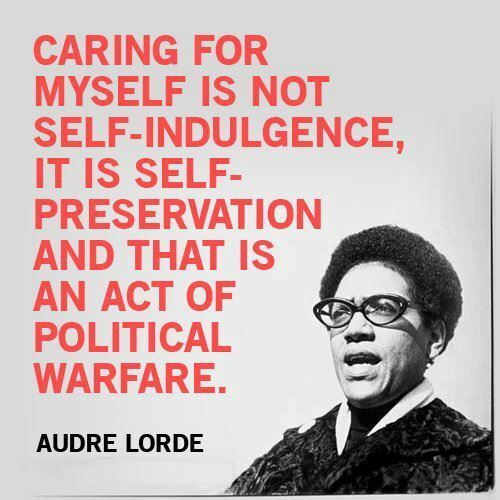 As Audre Lorde once noted, self-care isn't "self-indulgence, it's an act of self-preservation." For teachers who may be working in high-needs schools or who come from oppressed backgrounds, self-care is especially essential. The oppressor wants us to be too tired to survive and thrive. When we consider how much work we have to do to help the next generation of students revolutionize our current world, we need to ensure we have the strength ourselves to thrive. That means being OK with not being OK. It means learning to listen when we must accept our own struggle, name it, and in doing so, come out the other side that much stronger. Take the time to do things that make you happy. Establish days/nights/periods where you nourish the parts of you that are not directly school-related. Eat. Sleep. Take pleasure in life. It's so easy to forget, but so necessary. Implement mindfulness into your classroom, even in small ways. My 7th graders and I did five-minute morning meditations. It taught some great skills. Name your emotions. You model healthy self-awareness and understanding when you are vulnerable. Be open to share things like, "Man, I need a few minutes of quiet to settle in today, because I'm feeling some kind of way. Can we breathe together?" As I learned all those years ago, students are giving us so much love back that we may not see. Name your emotions to your colleagues and management. Ask for the space to take care of yourself. Consider adopting and incorporating SEL programs (my school used Toolbox) into your school's curriculum and training teachers in those techniques. Build time into professional development to help teachers foster relationships, trust, and safe spaces for each other. LISTEN, especially when teachers share they are struggling. It doesn't mean coddling them—it means validating that this job is really hard and trying to walk them through to a solution. Christina Torres is a middle and high school teacher in Honolulu, Hawaii. She blogs about her reflections on society, culture, and race in school for Education Week Teacher.